With the numbers out officially, it's clear that December 2018 has been a good month for some and not so good for some others. 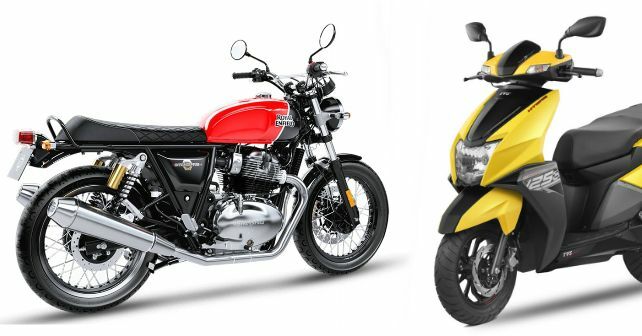 While Suzuki, TVS and Bajaj recorded good growth as 2018 concluded, Hero and Royal Enfield’s numbers weren’t as impressive. Let’s take a look at how the month played out for each of these manufacturers. Bajaj registered strong growth in sales in December 2018 – both, in the domestic market as well as exports. Last month, the company sold 1,57,252 units locally in comparison to just 1,12,930 units in December 2017. There was an equivalent rise in exports too – 1,41,603 units vis-a-vis 1,15,832 in December last year. And this result comes even when the Chakan-based bike maker hasn’t brought in any new products in recent times. That being said, the company is gradually updating their current product line-up with CBS and ABS to keep them in line with the upcoming 1st April, 2019 mandate. Suzuki bid goodbye to 2018 on a high note, as they registered a sales growth of 34 per cent. The company sold 43,874 units in December 2018 in comparison to 32,786 units in the corresponding month of 2017. In fact, 2018 so far has been a good year for Suzuki – the company has already crossed 5 lakh units in three quarters. Last year they could only sell 4,20,736 units during this time. Speaking about the achievement, Satoshi Uchida, Managing Director, SMIPL, said, 'The year 2018 has been eventful for Suzuki Motorcycle India. We not only had 3 new product launches, but also entered newer territories with a new premium scooter – Burgman Street, the Special One, a versatile adventure tourer – V-Strom 650XT ABS, and the apex-predator – GSX-S750. All the 3 models reflect the versatility of our product capabilities that aims to offer a premium and superior riding experience to every customer. The success of these models, in addition to our existing commercially successful models, has allowed us to close this calendar year on a high. With sales of 2,58,709 units in the month of December 2018, TVS registered a growth of 4 per cent in the month. The company could only manage to sell 2,47,591 units in December 2017. Growth in the domestic market wasn’t as high as TVS would have liked, but the company did export in larger numbers this December. TVS brought in three new products in 2018 – the Ntorq, Apache RTR 160 4V and the Radeon. With 56,026 units sold in December 2018, Royal Enfield recorded a drop in the local sales by about 14 per cent. Thankfully, a considerable rise in exports somewhat helped average the overall business in the month. The Chennai-based firm shipped out 2,252 units in December 2018 in relation to 1,601 units in the same month of 2017. Leaving December 2018 aside, the year so far has been a decent one for Royal Enfield. So far in this financial year, the company has sold 6,15,901 units as opposed to 5,79,462 units in the same duration in 2017-18.